Attorney Theresa Corcoran awarded with the Joseph Minsky Beacon of Light Award for 2017 — Kempster, Corcoran, Quiceno & Lenz-Calvo, Ltd. In June 2017, the Chicago Chapter for the American Immigration Lawyers Association (AILA) awarded Ms. Theresa Corcoran with the Joseph Minsky Beacon of Light Award for her outstanding mentorship to young immigration lawyers. The award is given each year to one individual who has shown dedication to the advancement of the immigration field. 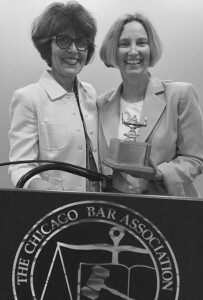 This year, Ms. Corcoran was recognized for her mentorship in the intricacies of immigration law. She has spoken and contributed to countless immigration conferences over the years and her expertise is noted locally and nationally. Kempster, Corcoran, Quiceno & Lenz-Calvo, Ltd. joins the AILA Chicago Chapter in congratulating Ms. Corcoran, who is a partner at the firm, for her outstanding work.